We haven't had a lot of snow or cold this winter, but you can't blame Mother Nature for destroying Cedarburg's ice skating rink. CEDARBURG — We haven't had a lot of snow or cold this winter, but you can't blame Mother Nature for destroying Cedarburg's ice skating rink. 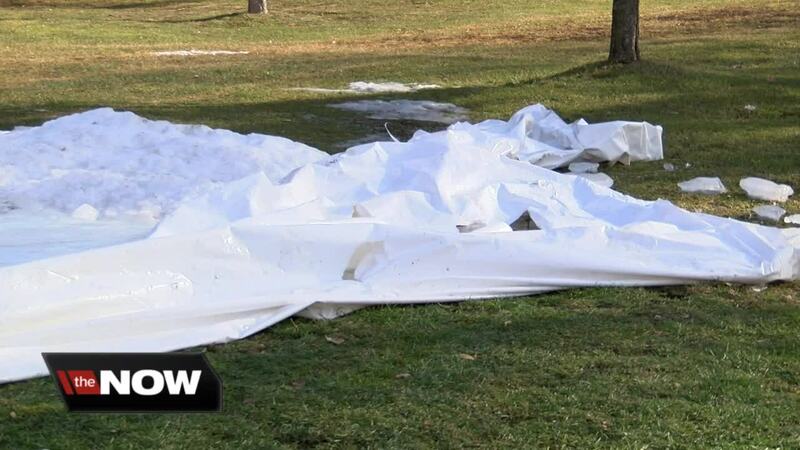 Despite having signs, barricades and even caution tape telling skaters to stay off the rink due to warm weather, some people got on the ice anyway and ruined the rink's liner. For the past eight winters, Cedarburg families haven't had to travel far to find a huge and free outdoor ice skating rink under the lights, but this season it's already out of commission at Cedar Creek Park. Puddles aren't the only problem. The liner that's supposed to be under the ice is torn apart and flapping in the wind. "This was a new liner and getting damaged within the first month of being open, it's frustrating," said Cedarburg Parks and Forestry Director Mikko Hilvo. Hilvo said the $1,400 liner is beyond repair due to a few people disregarding their signs to stay off. "Their ice skates go right through the ice and they go right through that liner and they cause rips into that liner," he said. Hilvo said it would take a month to get a new liner this size. By the time crews could get the rink up and running, winter would almost be over. "I just ask for future years that they listen to our procedures out here so that we can avoid this from happening again next year," he said. Hilvo hopes to one day add surveillance cameras to make sure those who break the rules know they're being watched. Cedarburg plans to purchase a new liner and reopen the rink next winter.